The 18-Volt Sub-Compact Driver-Drill and Impact Driver are a New Class Of Cordless, with the size and weight of lower voltage tools but with the performance, power and compatibility of 18-Volt. The kit includes an ultra-compact 2-speed brushless driver-drill with two speed settings that weighs only 2.7 lbs., and a variable speed brushless impact driver with two speed settings that weighs only 2.5 lbs. BL  Brushless motor is controlled to optimize battery energy use for up to 50% longer run time. Innovative Impact Driver Assist Mode (A-mode) feature helps eliminate "cross threading" by driving at low speed until impact begins, and offers improved control when driving longer screws. The DeWalt 12V MAX Cordless Drill/Driver Combo Kit offers a two speed transmission for optimal speed and torque control. The impact driver is designed for one-handed loading of the 1/4-inch hex chuck that accepts 1-inch bit tips. It also features three LED lights that provide visibility without shadows. Powerful and lightweight for comfortable use, the DEWALT 20V Li-Ion Cordless Combo Kit (2-Tool) has a lot of features that help the professional or Do-It-Yourselfer get the job done faster, easier and with more accuracy. The compact DCD785 Hammer Drill is optimized for small to medium fastening and drilling applications, while the high-powered and fast-speed DCF885 Impact Driver runs up to 2800 RPM with 1400-inch lbs. of max torque. Ideal for a wide range of applications, this kit is durably made for years of reliable use. The 2900-22CT M18 2-Tool Combo Kit includes the 1/2-Inch Compact Brushless Hammer Drill Driver (2802-20) and the 1/4-Inch Hex Compact Brushless Impact Driver (2850-20). The M18 Cordless System's patented technologies and electronics, innovative motor design, and superior ergonomics provide the most efficient blend of power, weight and performance in the industry. The M18 ½-InchCompact Brushless Hammer Drill/Driver is the Most powerful compact 18v drill on the market. The M18 1/4-Inch Hex Compact Brushless Impact Driver has the fastest application speed its class and delivers 1,600-Inch-lbs. of torque. Both tools feature MILWAUKEE built brushless motors, REDLINK Electronics, and REDLITHIUM batteries that provide more efficient power delivery, for fewer trips to the charger. Brushless 18V Li-Ion Sub-Compact Drill and Driver Combo Kit (2-Piece) The 18-Volt Sub-Compact Driver-Drill and Impact Driver are a New Class Of Cordless, with the size and weight of lower voltage tools but with the performance, power and compatibility of 18-Volt. 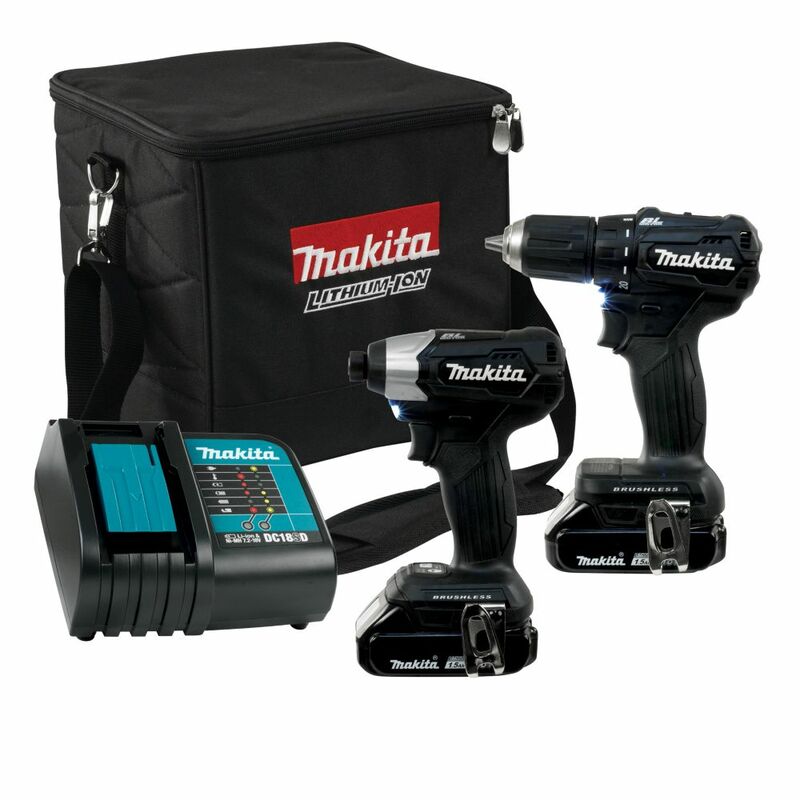 The kit includes an ultra-compact 2-speed brushless driver-drill with two speed settings that weighs only 2.7 lbs., and a variable speed brushless impact driver with two speed settings that weighs only 2.5 lbs. Brushless 18V Li-Ion Sub-Compact Drill and Driver Combo Kit (2-Piece) is rated 4.8 out of 5 by 12. Rated 5 out of 5 by PDonald from Great Kit Have had this kit for about six months, light weight and power are perfect. Use the impact all of the time, they're smaller but have the power. Batteries from my other Makita kit are compatible. Rated 5 out of 5 by M Young from Great Price and Excellent Product Hubby loves his brushless tools! More power, lightweight, last longer before needing a recharge. Rated 5 out of 5 by Short_final from Awesome tools These tools perform very well. It’s like having the torque of a large drill, but feather lite. Rated 5 out of 5 by CWKA from Great products. Light and powerful, great for home use. I have been using DeWALT for many years and happy with, but this set is better. Not made in USA - even better. Rated 5 out of 5 by Bcarter1986 from Big power, compact size Use this around the house and to run the jacks on my travel trailer. Super lightweight but still has all the power you need. Was skeptical about the 1.5Ah batteries but theublast pretty well. Rated 4 out of 5 by Theo from Good Product, But! Brushless is Better! Much improved over the brushed drill and driver. The set would have been a better value if it contained more powerful batteries. I was disappointed with the case supplied with the kit and think an injection molded case would have been more appropriate. Love the product but hate the case. Too early to comment on durability of product though. Rated 5 out of 5 by Alexfun from LXT 18V Li-Ion Cordless Sub-Compact Drill and Driv Super compact drill set and easy to use not too heavy perfect for home reno. Can you buy and use 3.0amp batteries for this drill sets? This is an LXT set, so I'm going with yes. Any of the Makita LXT batteries should fit this set. What is the size of the drill's chuck? They are 1.5 Amps the small ones I believe. &nbsp;Looked at the box in store yesterday.